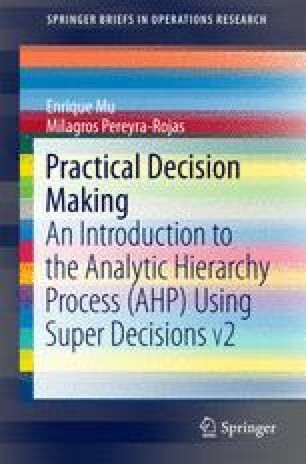 In this chapter, we will explain the fundamentals of the Analytic Hierarchy Process. The reader is referred to the original Saaty (2012)’s discussion of AHP or to Brunnelli (2015)’s for a theoretical introduction to the method. In this book, AHP concepts will be explained from a practical point of view, using examples for greater clarity. Deriving Priorities (weights) for the Criteria https://mix.office.com/watch/4odxenri07nm. Deriving Local Priorities (preferences) for the Alternatives https://mix.office.com/watch/1idaxl30c6o5o. Decision Lens. (2015). Decision Lens. Retrieved from http://www.decisionlens.com. Expert Choice. (2015). Expert Choice. Retrieved from http://www.expertchoice.com. Super Decisions. (2015). Super Decisions. Retrieved from http://www.superdecisions.com.